In the 1970’s I was a teacher at Colegio San Silvestre in Lima, Peru. In August, 2016 I was thrilled to be able to return. Finally I was able to visit Cusco, visit a beautiful Montessori school and talk to teachers there, visit Machu Picchu, and give a Montessori presentation to about 30 or 40 people in a lovely hotel in Lima. Three months later I was invited back to give presentations on AMI Montessori at three universities, with Susana Chavez, AMI teacher from Lima as my translator. On the first day we spoke at Universidad Femenina Sagrado Corazon for 250 people with a wonderful response. In the afternoon the talk was given at Universidad Peruana Cayetano Heredia. 80 invitations had been sent out and 1000+ people showed up! They stood in line around the block in the hot sun for 2 hours before the talk; we needed two additional rooms and video conferencing to accommodate the overflow; and since there was not room for the 150 people still waiting outside, I repeated the talk (how could I say “No”) and some of the attendees from the first talk who asked if they could repeat. I think Peru is ready for AMI Montessori! My last talk was given the next day at the esteemed Universidad Nacional Mayor de San Marcos, founded in 1551. The universities wanted to make these talks available in real time as video conferencing, but I am always afraid that I won’t be natural and relaxed, and I don’t want to discourage questions from the audience. So since I have been asked by many people to share the information from the presentations, here is a brief overview and that basis of the talk, which was presented in Portland, Oregon in 2013 was published and is available on Amazon or from Michael Olaf. I always love to talk about how neuroscientists are more and more able to explain scientifically the valuable elements of Montessori practice that we have observed over the years. One example is the need for repetition. We now understand what neurons are firing when a child is repeating a puzzle for example, and why this changes in the brain when the puzzle is “learned.” This reinforces the importance of allowing the child to repeat until he or she decided to stop. Also we can now understand, as we learn about multiple intelligences and executive functions (see this explanation from Harvard University. And how basing Montessori practice on natural human needs and tendencies, such as exploration, real work, communication, concentration, etc., is far more valuable in preparing for the years to come, than basing education on a static academic curriculum. Exploration begins at birth and the Montessori 0-3, Assistants to Infancy program helps parents support this need in the home. In my work around the world I find that in some countries children, like the child in this picture in Bhutan, automatically explore and participate in the work of the family which has great benefits in may ways. In places where this is not supported (giving children toys and other ways of being entertained instead of sharing the daily life and work) Montessori environments provide real work, called “practical life” in the Montessori environments, from very young ages and through high school. Here we see children preparing food and serving themselves in Montessori Infant Communities (age 1-2.5+) in the Torres Straits north of Australia, and in Japan. The need to study and support the development of communication is ongoing in Montessori environments at any age. Here we see a mother explaining everything she is doing as she dresses the infant, and the child’s face reflects the joy of this experience. In the second picture students in 6-12 environments in Hawaii are explaining, during parents’ night how mathematical cubing is learned first with hands-on materials and then in the abstract. It was fascinating to watch the communication between the students and the parents in these groups. Two years ago, while consulting with a Montessori school in Morocco, North Africa, I was taken to visit an orphanage because no matter what country I visit I am always interested in the lives of children in the first years of life. The babies were kept for most of the day isolated in cribs because the ratio of babies to adults makes it difficult to o anything else. The Montessori school to help this situation so I suggested setting up a Montessori First Year orphanage project because a lot of very important changes can be made at this age with very little training and materials. One year later I gave a talk at the orphanage and found people so excited about the potential of these children, their language, movement, and general excitement with life. Above you can see the “before” and “after” pictures of this project. In 2003 as I was preparing to leave for my second trip to learn about Montessori with Tibetan refugees, this time to travel to Tibet, my husband gave me a New York Times story about a blind school in Lhasa. When I visited I was pleased to see Montessori materials, such as the dressing frames, being used. I did not go into detail about this during my talks in Lima, but I would like to share a bit more of the story. While studying Chinese and Asian civilizations in university in her home in Germany, Sabriye Tenberken, who lost her sight at age 12, was stunned to learn that in Tibet blind children were living in appalling conditions—shunned by society, abandoned, and left to their own devices. The decision was instant: she would go to Tibet to help these children. She single-handedly devised a Tibetan Braille alphabet and opened the first school for the blind in Tibet, with only a handful of students. From its modest beginnings, that school has grown into a full-fledged institution for visually impaired people of all ages and in other countries. I met one young woman who had spent the first 18 years of her life doing nothing in her home until her grandmother brought her to this school. After three years, at the time of my visit, this girl could read and write in Chinese, Tibetan, and English; she had received training as a masseuse and was preparing to move into an apartment with a fellow student where they would live independently thanks to the Practical Life skills they had been taught. As she was giving me a tour of the school I commented on the beautiful colors painted on the walls of the school garden. She remarked, “Yes it is amazing how many visitors are unaware of the fact that we can “see” colors through our fingers. This sent me back to what I had been learning earlier (in the book “Train Your Mind, Change Your Brain. Montessori Ageing Support Services, a division of the Montessori Australia Foundation, is the national organization for supporting quality of life for older Australians through the Montessori approach. This work has spread to many countries as a result of being presented at the AMI, Annual General Meeting of the Association Montessori Internationale in Amsterdam a few years ago. Soon after Tibet was taken over by China in 1959, as hundreds of children began to arrive in Nepal and India, the Dalai Lama said that even though food and shelter were priorities, education must begin immediately, and the educational system chosen was Montessori because of Dr. Montessori’s years of work in India. Above is a class in Dharamsala I visited and consulted with the teachers in 2002. Today there is work being done in the AMI Montessori movement to help refugees all over the world, including those leaving Syria. Bringing Montessori to a new place, to a new country, is not an imposition of “Western” educational ideas, but a melding of what is important in the local culture. Research is done on the practical life of the culture, the language, and the arts. Above you can see pictures of the value placed on music in Tibet and Russia. While visiting a Montessori school in Lima this month I was honored with a production given by the children. They study the history of their country through the costumes, music, dance, and stories of, in this case, the Inca civilization. In the video above you hear the wife of the Inca imploring people to follow his guidance. Although the teacher of this class in Bhutan had earned an AMI diploma in Thailand, the observation and student teaching of the course had been waived because there were no AMI classes for this element of the training. As a result she did not what a real AMI 3-6 class looked like or how it functioned. My daughter Narda (also AMI 0-3, 3-6, and 6-12) and I took donations from schools in the USA and had furniture and materials made. Then I spent three days mentoring the teacher. The parents were so amazed that their children could actually choose materials, take them to a floor mat or table, work on them, put them back, and help each other, that they huddled around the classroom windows to watch. 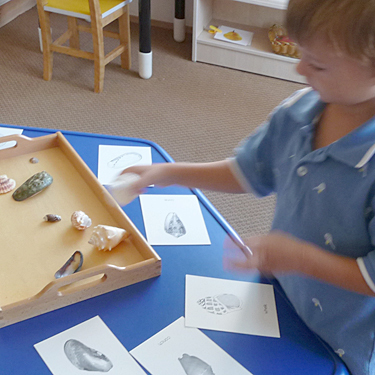 The Montessori way of meeting the needs of children is not a mental construct imposed on an empty slate. It is a discovery of what nature intended, of the potential of the child, the human, when the emphasis is on observation and discovery of this person, of creating an environment that supports life, and in learning (through good Montessori training) how to put the person in touch with the environment so he or she can make intelligent choices, concentrate, evolve. This is the true work of Nature. 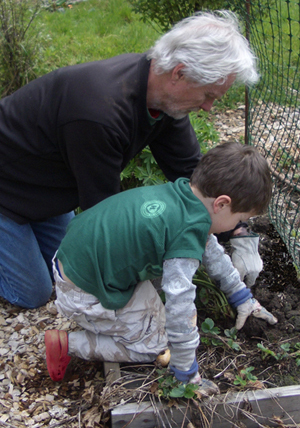 As we allow children to experience nature and to learn to care for plants and animals, he experiences first hand the meeting of the same needs he has. Above you see a child who cannot yet walk alone exploring a field of flowers as he walks with what we call the GOOD walker so he can stop, sit down, pull up, move forward, and touch and smell as he desires. The last two pictures are from a classroom in Moscow where children have brought the colored leaves to study, and then go on to explore leaves further through the Montessori “leaf cabinet”, and vocabulary, and art. This has been a very brief sharing of my talks in Lima, but I hope it has been enough to give you a taste of the potential of Montessori in many ways to support the very best physical, mental, emotional, and spiritual growth and happiness of children and adults. It is my hope that with the best of this natural education we will someday have more adults who are less violent, greedy, and prejudiced, and who can strike a healthy balance in their own lives, and take pleasure in caring for others and the environment. Susan in Mongolia exploring education from birth in that part of the world. This is an excerpt from an article printed in The NAMTA Journal, Global Citizenship: Uncovering the Montessori Mission, Volume 40 Number 2, Spring 2015. Susan Mayclin Stephenson tackles a large subject, Cosmic Education, which Montessori defined as a “unifying global and universal view[s] of the past, present and future.” Stephenson takes the reader from birth to the end of the elementary age with examples of how the child grows into an understanding of Cosmic Education through their experiences at home and at school. Central to her thesis is the theme of discovering one’s cosmic task, which depends on “fostering…curiosity and compassion toward other beings.” Stephenson concludes with examples from around the world and illustrates how children are born with this tendency toward compassion and how it is experienced from birth through age twelve within Montessori environments. Observing starfish on the California North Coast before gently placing them back in the water. The word cosmic today usually means something very large or having to do with the universe. But the word comes from the Greek kosmikos, from kosmos, meaning order. The term Cosmic Education in Montessori lingo refers to a child’s gradual discovery of order, a unifying global and universal view of the past, present, and future. It is the coming together of many components of knowledge into a large vision or realization, as in a mosaic, of the interdependence of elements of the solar system, the Earth, planets and animals, and humankind. The character of our time is sometimes referred as the information age; today’s children are bombarded with facts and information with no way to make sense or bring this information into some kind of order. Cosmic Education helps a child make sense of all the information and is more important today than ever before. One page of a Montessori 6-12 class student journal of work. These principles of Montessori education are usually discussed in reference to the second plane of development, the years 6–12. But such an idea is not something Dr. Montessori invented for the elementary child as an academic curriculum. As usual, she “followed the child” and the child’s interests. This does not begin at age six. A painting by the author, big brother holding his infant sibling safely and comfortably on a Montessori “topponcino” which is made during the AMI Montessori Assistants to Infancy course. The discovery of Cosmic Education and one’s cosmic task depends on fostering the curiosity of the human being and the natural tendency to feel compassion toward other beings beginning at birth. There is evidence that natural curiosity and feeling responsibility for others, or compassion (the sympathetic consciousness of others’ distress together with a desire to alleviate it) begins long before the child enters the elementary class. Wanting to be useful and helpful and caring about the happiness of others is not something that needs to be taught; it is a basic part of the human make-up and can be observed even in the very young. Math, such as this child is enjoying in a school in Paro, Bhutan, is just as enjoyable and interesting as any other subject in a Montessori class. It should be realized that genuine interest cannot be forced. Therefore all methods of education based on centres of interest which have been chosen by adults are wrong. Moreover, these centres of interest are superfluous, for the child is interested in everything. A global vision of cosmic events fascinates children, and their interest will soon remain fixed on one particular part as a starting point for more intensive studies. As all parts are related, they will all be scrutinized sooner or later. Thus, the way leads from the whole, via the parts, back to the whole. The children will develop a kind of philosophy which teaches them the unity of the Universe. This is the very thing to organize their intelligence and to give them a better insight into their own place and task in the world, at the same time presenting a chance for the development of their creative energy. Children record their favorite math, geometry and algebra discoveries over 6-12 years of the elementary class. And enjoy decorating the margins and using colors to make a beautiful record of their work. This Michael Olaf Montessori newsletter for parents and teachers contains excerpts from the 0-3 book The Joyful Child: Montessori, Global Wisdom for Birth to Three Years and the 3-12+ book Child of the World: Montessori, Global Education for 3-12+. Montessori Newsletter #18, Concentration, Where the Magic Happens! Concentration, Where the Magic Happens! When work and concentration on activities appropriate for the child’s stage of development are protected the potential for optimum development is seen in ways previously not thought possible. A human being is revealed who knows that happiness does not come from things or fame, who exhibits a love of silence, a natural impulse to do good work, to learn, and to help others. This is the magic of Montessori.